Home / How Does a Dental Implant Work? Dr. Navid Rahmani is an internationally recognized, Board Certified Periodontist and best rated dental implant specialist. All procedures are performed in our Midtown NYC dental center. The easiest way to think of a dental implant is to imagine it being an artificial tooth root as its design closely imitates the structure of a natural tooth. Whereas your natural teeth are best described as having two separate parts which are the tooth root and the crown of the tooth which is seen above the gums. We use only the newest and most advanced dental equipment available on the market in USA. We use top quality medical grade titanium or titanium alloy, the same materials used for other bone implants and for orthopedic joint replacements. Difference between titanium and zirconia dental implants. Most dental implants we use in NYC dentistry center are made from three separate pieces, with one part being the final restoration that will replace the missing tooth or teeth. 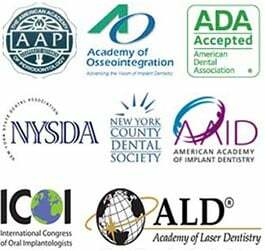 Dental implant in NYC is also completed in several different phases. Dental implants usually have three main components which are the implant post or screw, the abutment and the tooth restoration but there are other variations or components of dental implants. After first assessing you, Dr Rahmani will carefully plan the implant surgery before creating an opening in the gum tissue so the implant post can be inserted directly into the jawbone. Once the implant is placed it is generally covered up with a healing cap and will be left to fully integrate with your jawbone. Osseointegration, integration process that will take place between the living bone and the surface of your implant . Your new implant will generally need between two to four months for osseointegration to be completed. The second stage of treatment will involve attaching the abutment to the implant. The easiest way to think of an abutment is being like a tiny, stubby tooth that protrudes just above your gum line. If you have ever had a tooth prepared for a crown then an abutment can look very similar. During the final phase of dental implant treatment, your new tooth will be made and fitted in place.